Cost effective on is the aim that both customers and suppliers are pursuing. When we receive the drawing from customer, the first step we should do is reading carefully and judging the complex stage. 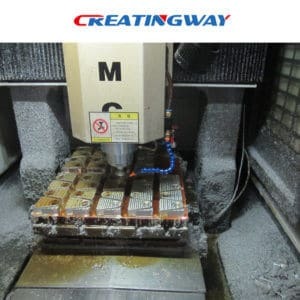 The complex is not just how the product looks like, but also how difficulty when workers make it out, that is to say, what kind of setting up and fixturing of cnc machining they will use. It is the core factor to affect the cost. So when you know some knowledge on the cost effective process, it will avoid many complex,difficulty and high cost drawing by just optimizing the drawing a little. Obviously, vise fixturing is the most common and least expensive method of workholding. It just requires the part of two parallel sides, then grip them by vise jaws. It is a really common method,and make the process much easier. For the parts of two parallel sides, we can make them by vise fixturing with low cost. But how about the parts designed without parallel edges? Then we will use softjaw fixturing. This is when vise jaws are cut away in the same shape as the part to be machined. The cost will be higher than vise fixturing, since it does require an extra machining step, but relatively speaking, it is still fairly cost effective. For parts that don’t require flood cooling, we can use double sided tape which works well for parts. The weak points are it will require a large surface area for the tape to hold, and the adhesive is difficult to remove after machining sometimes. For some larger, plate-like parts that can not be held by vise, we can using holes to bolt the part down. Sometimes, we can use some existing holes, but we should negotiate with designer first. In order to save time, if the holes which can be cut for this purpose are stated in the drawing, it will be better. The most cost effective parts are those without features on the side or back. It will be much cheaper since it doesn’t have to be reset and the part re-fixed. It is our great honor that we are treated by our customer professionally.we always communicate with customer regularly and promptly, consulting on design issues by phone or emails. We both pay bills on time. We are not a quoting service by just negotiating on the part costs. The most important is to discussing with customer to have any advice on ways to decrease the cost.